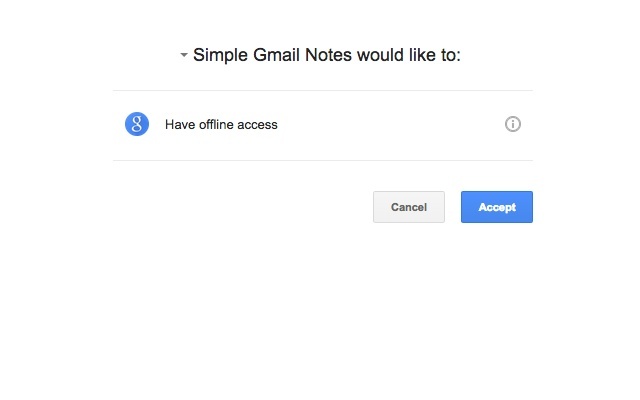 One week after the Chrome extension of simple gmail notes was released, I started to plan on porting of extension to Firefox. I spent quite a lot of effort to work out the google API for the extension. Most of them are just RESTful HTTP API, which are supposed to work with Firefox extension right alway. During the implementation of Google extension, I tried to get way from most Chrome specific API (e.g. chrome sync). So theoretically most code should work with Firefox extension. The biggest problem to start the development of Firefox extension is, you cannot Google out the result easily. The most intuitve keywords for Google should be “firefox extension tutorial“, or “firefox extension development“. Yet, for both cases, the optimal / best result is not inside the first search two results. It’s not a big problem for experienced developers, but if you are going to get started on this field, it’s going to be a nightmare. Most of search results are from the same official site of https://developer.mozilla.org, it seems they did not give a well structured SEO for the Google search. Some outdated pages got a even higher SEO ranking than those new ones. Another depressing thing is, for the first search result, the tutorial mentioned a hello world sample, which is a dead link! That’s really bad, When one started to learn something totally new, the worst thing that could ever happen is a surprise of frustration, no matter how small it is! Actually, like most developers, I only want a simple list of instructions to get started. And if possible, I want to follow a step by step hello world tutorial, just like the search results for Chrome extension do. After wasted a few days on the wrong paths, I finally got some basic understanding about the Firefox extension/addon development (extension is a subset of addon). cfx – use python for development, replaced by jpm since Firefox 38.
chrome extension comptable SDK? – totally new API structure. And it’s announced in the middle of development of my Firefox addon. Not sure how the jpm thing will evolve in the future. Anyway, for now, the best option for Firefox extension development would be using jpm SDK. Thanks for the template project of firefox (though it’s in cfx), it makes my development much more easier. After struggled a few days on the structural discrepancies between Chrome and Firefox extensions, the remaining change on source code is actually relatively small. It only took me two more (half) days to port the whole project. 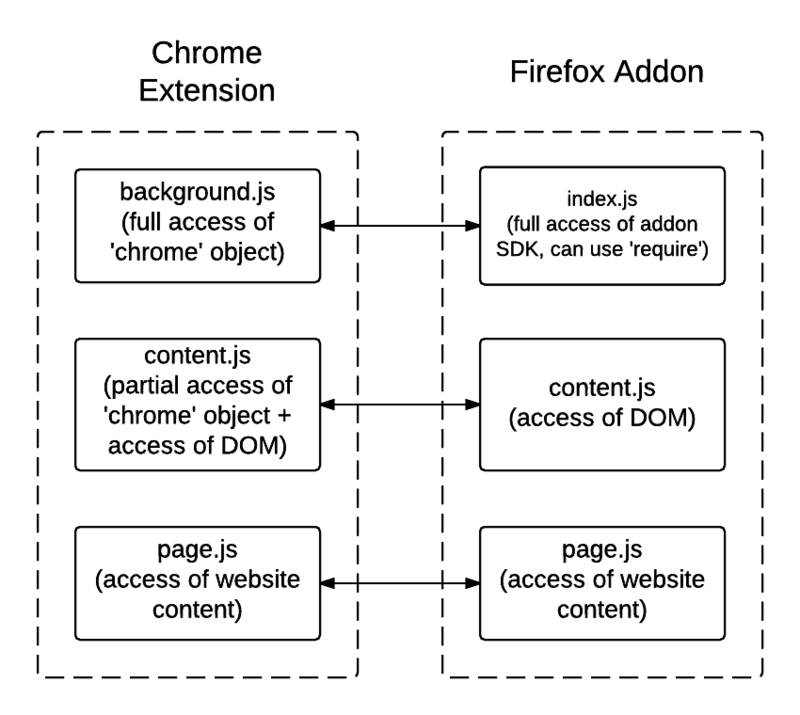 Here is the messaging structure of Firefox Addon. Firefox extension has some difficulties to find the currently active tab in the background script (unlike Chrome extension), so you better passing the worker object to the all the procedure calls, only the worker could reliably send the message back to the content script. Firefox extension debugging is less smooth then Chrome extension. Yet it is still relatively easy using latest jpm. The default execution command jpm run would start a new profile each time, which could be problematic if your site is web page related. 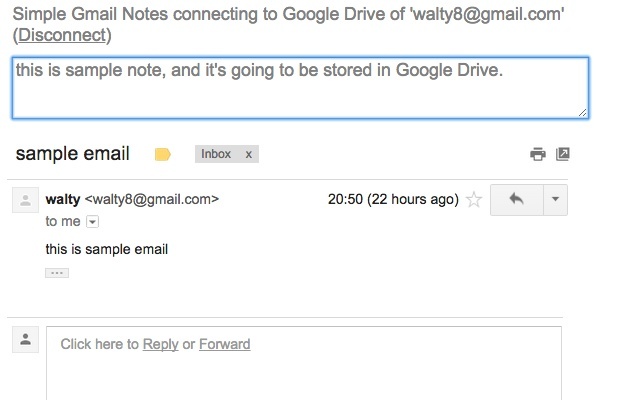 For example, I have to log into the Gmail account every to debug the Simple Gmail Notes, and it’s really painful. Yet, I still got one most painful expreince here. For one time, somehow the whole debugging system collapsed, all console.log failed. I have no idea what happened. No error message, no warning. All logs jsut disappeared, which makes further development impossible. I suspect there is something wrong with the configuration, or the early executed source code, or the Firefox profile, but I failed to dig out the root cause. Finally, I have to redo the work again from the last SVN version, and this is really bad. Fortunately, it only happened for once. The publishing of Firefox extension is much slower than the Chrome extension in general. It took about 1 hour to be publish the extension in Chrome extension store. For the Firefox extension, however, it took about 4 days to finish the publishing process. version 1.6: I put some .bak files and .bat files inside which are not used by the extension. version 1.7: the oauthorizer checksum is not correct, because I modified a little bit of it. solution: instead of using npm install, I copied the files into the root directory, and explained to the reviewer my changes. solution: Both are related with the imported library of gmail.js. 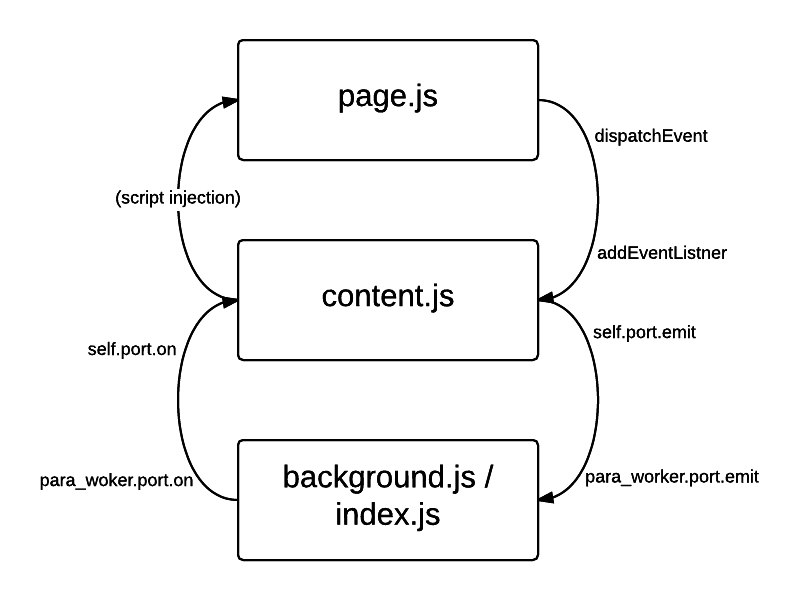 I downloaded the more original jQuery script, and further explained where the DOM monitoring happened. As one could see, it’s a much more strict reviewing process then the one of Chrome extension, for which I believe only minimal automatic checking is provided. My feeling is that Firefox is very cautious about the malware, that’s why they explicitly require the matching of checksum against the minified code. Each time the extension is rejected, I have to generate a new version (with new version number) in order to have the extension approved. Normally the waiting time is less than 24 hours. But one time is really fast, it took the reviewer less than 30 minutes to check and reject my app (version 1.7). From the Google search, many people complain about the slowness of queue, but it’s actually not that bad. But I don’t really think it’s a queue. The queue number moved extremely slow, it may move from 137/140 to 135/140 after two hours, and then fall back to 138/145 after another hour. The number goes forward and backward. But in general, if you don’t stare at the queue number, the review would get finished within 1 day (at least for my case). Both Firefox and Chrome extensions basically got the exactly same UI and functionality, since the Firefox extension is merely a ported version. In general, the active users of Firfox extension is fewer than the Chrome extension one, it’s probably related with the difference of user base between the two browsers. This post is actually a good one it assists new internet users, who are wishing in favor of blogging.